Customers from far and wide regularly enquire about Tuffa’s steel oil tanks on account of such perks as the option to have them manufactured to any desired dimensions, from only high quality steel. Whatever the site requirement, a Tuffa steel tank offers true design versatility. Each one has a serviceable life of more than 30 years when appropriately maintained, is fitted with only premium ancillary equipment and can be specified in a choice of colours and finishes. Furthermore, Tuffa steel oil tanks can also be fire protected tanks. Tuffa FireStop is a market-leading and innovative means of protecting your tank from conflagration, able to be factory fitted to a steel tank. It is a convenient and simple solution, with no need for on-site barriers, firewalls or brickwork, and cost-effectively ensures your steel tank’s compliance with building regulations. There is simply no better company to which to turn for steel fire protected tanks than Tuffa, given the Uttoxeter firm’s continual research and development in this area. This is similarly in evidence when one looks at the actual Tuffa range of steel fire protected tanks. 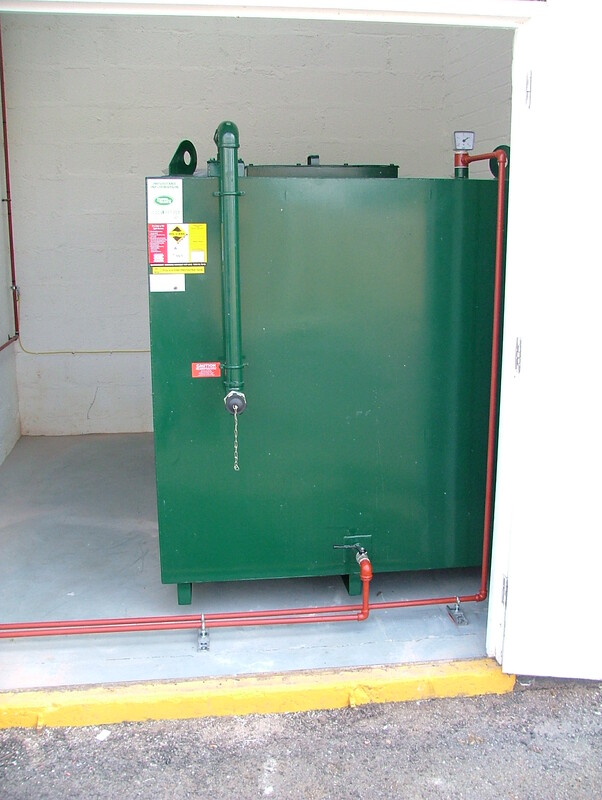 Even the tank with the smallest capacity of 900 litres, the 900SBFP, is an extremely dependable full bunded tank in green, sporting not just integrally fitted fire protection but also, on the top of the tank vent, a 2″ BSP fill point complete with cap and chain. Also to be found on this part of the tank is a float level gauge and electronic level gauge, while optional extras include alternative colours, bespoke cabinet types and a ‘tank pack’ consisting of a 1″-1/2″ adaptor, ball valve and filter. Such extras are available across a selection of steel fire protected tanks also offering 1100 litre, 1400 litre, 1640 litre and 2310 litre capacities, the latter measuring 2500mm in length, 1250mm in width and 1250mm in height. Customers should also be aware of such features as an overfill prevention valve, channel runners and lifting lugs that may significantly enhance a tank’s functionality, but also have other implications for how and where the tank can be used. This makes it vital to study the specification of each tank prior to purchase. For those requiring that little extra peace of mind with their steel oil tank, FireStop protection can represent a hugely worthwhile investment.